Start your conference with a BANG! Reinforce your message & Send delegates home on a high! 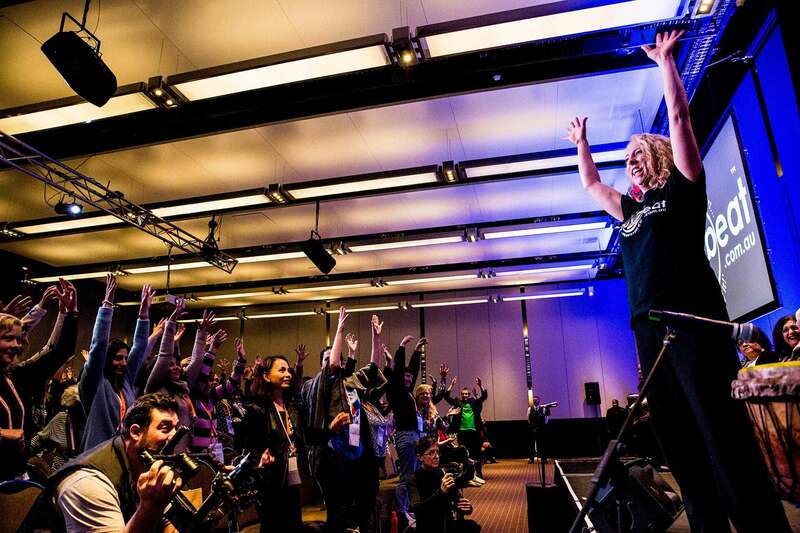 Here’s an ACTION packed, audience-interactive drumming spectacular that's guaranteed to WOW, revive the senses, and leave delegates feeling uplifted, re-energised, and inspired for success! There’s nothing like a motivational NON-speaker to give your conference the ultimate platform on which to deliver the company message and send delegates home full of self, team and company belief, as well as a positive recollection of your conference. AFROBEAT knows how to keep delegates energised, entertained and focused throughout your conference, and the rhythm ensures your message and content of the day will be remembered, talked about and shared long after your event. 1. Start your Conference with a BANG! Drumming is an unbeatable opener to any conference size. With many companies having offices all over the country and with working from home becoming increasingly popular, many of the delegates attending a conference will not have met each other before or not connected in a long time. So if people don't know each other, how on earth will you get them to effectively communicate with each other? Drumming together is an excellent ice breaker that helps to remove social barriers in a non-intimidating, fun atmosphere. Participants relax, gain enthusiasm and the necessary confidence to fully participate in the conference or later learning and networking experiences. Guaranteed to unite everyone in the room within minutes, drumming together has the power to connect, engage, and transform audiences to the beat of the drum. It will give your conference speakers a solid platform on which to deliver the company message. A drumming energiser doesn't have to be time consuming. In fact a good drumming energiser can last as little as fifteen minutes and have a great impact. Drumming together fosters greater levels of participation in both small group, and whole group activities, and engenders an enhanced sense of well-being and connectedness amongst delegates. 2. The ‘Graveyard’ hour – the hour directly after lunch! This is a prime time for a conference energiser. It's the time of the nodding heads, as your delegates struggle to keep awake as a direct result of a good lunch and a comfy seat. Drumming together will get your delegates moving around, interacting and get the blood pumping around their bodies to wake them up! Keep people energised and focused by planning regular 'mind breaks' to stimulate productivity and contribution. Take a mind break, meet the alpha-state, release those stress endorphins, and explore the ingredients of team success with Afrobeat's Interactive Group Drumming! The Drum Room is a designated space with a round circle of chairs and African Drums on offer. Small groups of delegates can rotate through the activity throughout the day, creating their own music in a facilitated Interactive Drumming experience. 4. Send your delegate’s home with an extremely positive and memorable message! The drum and its rhythms have inspired solidarity, empowered, and mobilised the human spirit since ancient times, making ‘drumming together’ the perfect way to end your conference. 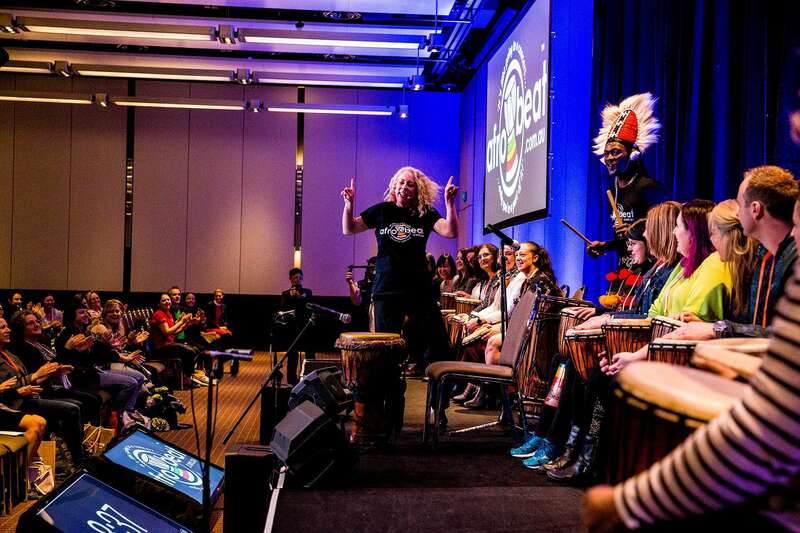 Often the most effective time for a conference drumming energiser happens just before the conclusion of the conference. Energise them then, and they'll go away on a high! They will be full of self, team and company belief and they will have a positive recollection of your conference when they leave. This could possibly be the most important time of the day for an energizer. 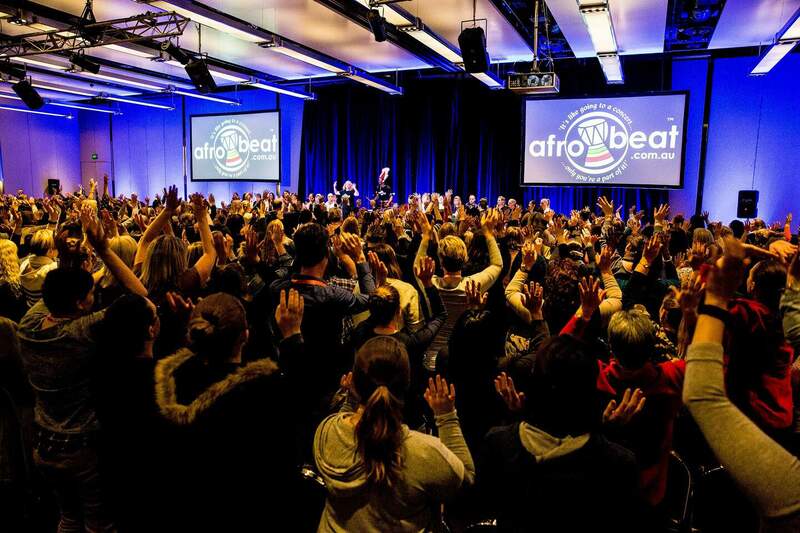 Afrobeat’s conference energisers are a powerful platform on which to deliver your message of the day, and can be effective for any group size, and venue. Afrobeat was really well received by the majority of our conference delegates. It was a high energy activity at the end of the conference day which was needed after heavy content sessions. Everyone was thoroughly surprised and enjoyed the drumming. The guys were great and very helpful. Thank you for being such lovely people to deal with and I hope that we will be able to have this experience again sometime in the future. Excellent! An experience that won’t be forgotten. Everyone loved the activity. It was amazing. Many teachers wished they also chose this workshop. I was in this workshop and I really enjoyed it. The two that facilitated this were great please pass this onto them.